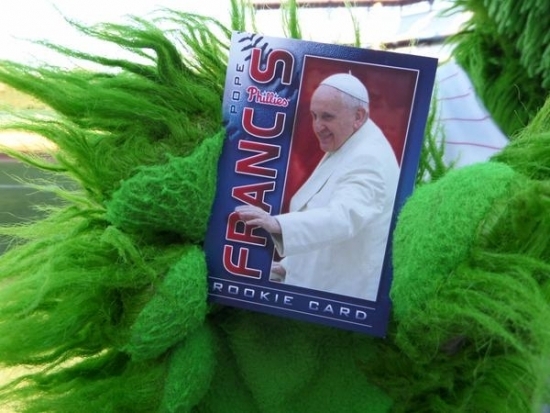 Yesterday the Phillies revealed their tribute to Pope Francis - his own rookie baseball card (pictured in the paw of the Phillie Phanatic). The Phillies are on track to lose 100 games this year, but the addition of Pope Francis to the fold can certainly lift spirits around the City of Brotherly Love. Former 76er Moses Malone passed away yesterday. The Hall of Famer was found dead in a hotel room in Norfolk, Virginia. Moses Malone led the 76ers to the 1983 NBA Championship. With a team that included "Doc" Julius Erving, Malone suggested the Sixers were capable of sweeping the playoffs going "Fo, Fo Fo". He wasn't far off as the 76ers ran through playoff opponents Fo, Five, Fo to win the title. Moses Malone was 60. Today is September 11th, marking the 14th anniversary of the terrorist attacks on the World Trade Center in New York, the Pentagon in Washington DC and Shanksville, PA. Nearly 3,000 people lost their lives that day, mostly civilians and first responders. President Barack Obama is scheduled to observe the anniversary with a visit to Fort Meade, Maryland, in recognition of the military's work to protect the country. The Phillies set a new record last night. Although the organization is not particularly proud of this one. Last night's loss to the equally poor Atlanta Braves was played in front of an announced crowd of 15,125, a new low attendance record for Citizens Bank Park. Monday night marked the fourth time the Phillies had set a new low for the 12-year-old ballpark, which has hosted 1,203 games since 2004.